When it comes to choosing new kitchen cabinets, there are a variety of options to choose from. You not only want them to be functional as well as appealing. If you are having difficulty deciding which material you want to use for your kitchen cabinets, melamine cabinets are a great choice. In today’s blog, we will be taking a closer look at melamine kitchen cabinets and the benefits they offer. Melamine is a synthetic material that is made up of different things, including resins, wood particles, and even paper. Melamine has become a material that offers a wide variety of options and can even be a nice alternative to wood. Because of the way melamine is manufactured, it has a number of different benefits that are making it a popular choice for homeowners and contractors alike. In a heavy-use, high traffic area such as your kitchen, it makes sense to want kitchen cabinets that will be able to withstand wear and tear. Melamine has a tough outer layer which makes it resistant to excessive moisture, stains, and heat. Plus, since it is manufactured with hardened resin, this material is able to stand up to scratches, dents, and chips. Lastly, melamine cabinets will not fade or crack over time. Melamine cabinets are also a popular choice because it offers so many selections for homeowners, designers and builders to choose from. This means it will be easy to match the current style of your kitchen or create a customized space without being restricted by limited choices. Whether you want neutral white cabinets, grey, light blue, or a brighter, more vibrant color into the area, you will be able to find just what you are looking for with your melamine cabinets. Some melamine cabinets are even made to look just like real wood cabinets, complete with authentic wood grain patterns and rich wood tones that appear natural. Kitchen remodeling projects can be costly, particularly if you to factor other expenses into your budget such as appliances, countertops, or splashbacks. Being an affordable material, melamine cabinets can help you stay within your budget, leaving you with additional funds to be put towards another part of your project. Despite being a cost-effective material, melamine is aesthetically pleasing and a great alternative to high-end and expensive kitchen cabinet options. Incase of splatters and other messes, you will want your kitchen cabinets to be clean. Luckily, melamine kitchen cabinets are very easy to clean; all you need to do is wipe them regularly with soapy water and dry them with a soft cloth, and you will have clean and appealing cabinets! The benefits that melamine cabinets have are quite hard to beat when it comes to looking for a stylish kitchen cabinet material that is both durable and relatively inexpensive, making them a great choice! 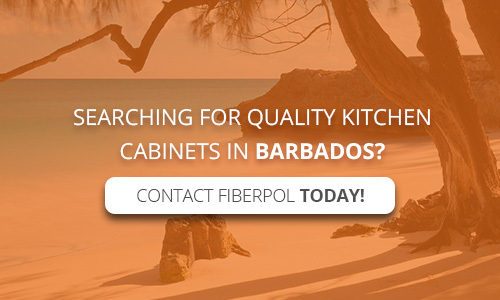 If you are in need of kitchen cabinets, there is no better remodeling company to work with than Fiber Pol. Our cabinet material of choice is melamine. 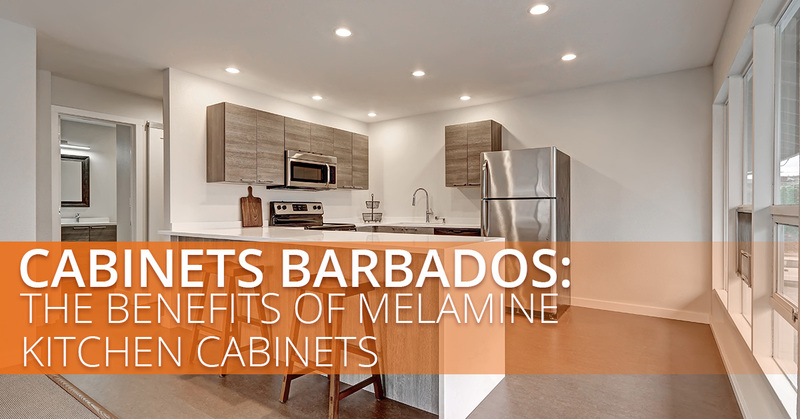 In addition to being durable, we like melamine cabinets because, unlike plywood cabinets, they are not susceptible to termite and powder post beetle infestation, which is an important consideration when living in a tropical climate, like Barbados. Our melamine cabinets can replicate real wood cabinets with thermafoil finishes, or you can choose from over 100 paint finishes. If you are interested in learning more about our kitchen cabinet options, contact our remodeling experts for a free estimate.